Some hockey nights are more special than others, sometimes it’s about more than the game itself but rather the people who are with you. This one in particular will always be on that stands out. 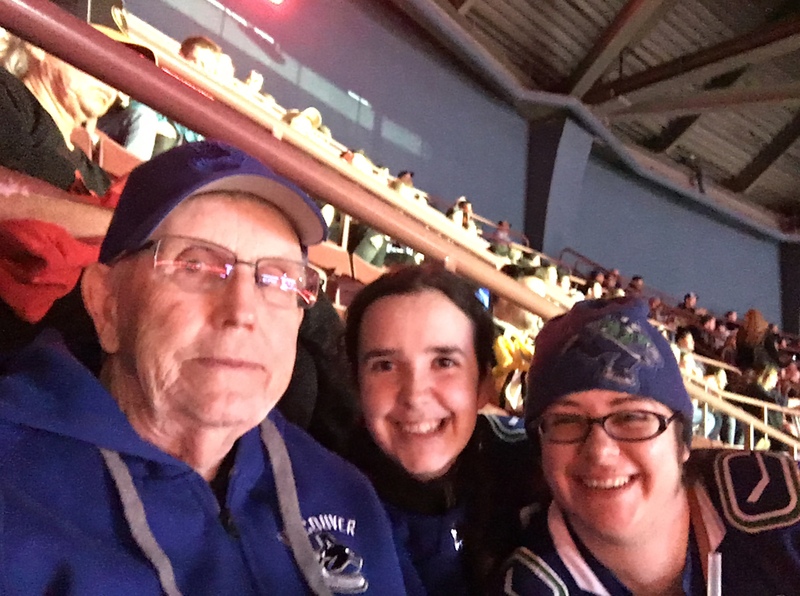 This past weekend, we took my 90-years young Grandpa to his first ever Vancouver Canucks game. When he planned his visit a few months back, he said that it would be really fun to attend a hockey game together while he was here. And you know me, there was no convincing need on my part! So we took a look at the team’s schedule to plan out which game to attend together. We gave him the choice of games that would be available to him during his stay: Boston, Washington and Pittsburgh. He chose Boston, as they are an original six franchise. And as you can imagine, as a Canucks fan, it may not have been my first choice of rivals to watch BUT it was not about my choice. It was his choice. And it was a great choice in the end but more on that later. First things first, once the he made his choice we had to find tickets for the four of us that would be attending the game: my Grandpa, my dad, my sister and myself. Once we secured the four tickets, the next step was making sure he would be properly outfitted in Canucks attire for the game. Up next was the long awaited game day! We made the trek to the arena all geared up and ready to take in all the sights and sounds, ready cheer on the home team! It’s no secret that I’m ALWAYS going to root for the Canucks despite whatever the odds may tell me prior to any given game. 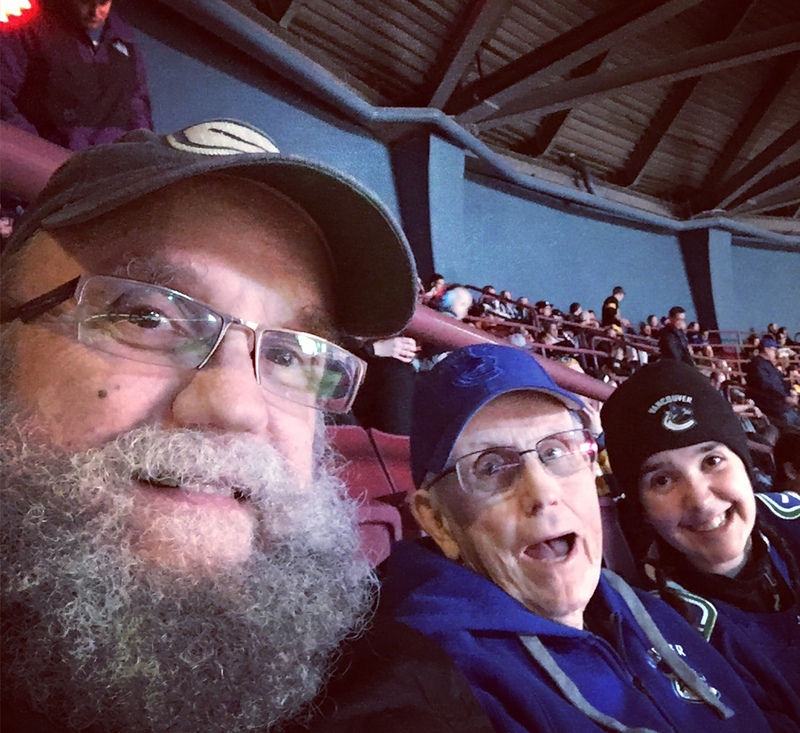 This game was no different, I was told many times that this may not be best the game to bring Grandpa to as many did not expect the Canucks to put up much of a fight against a resilient Boston Bruins team. The expectation from them was a guaranteed loss with little or no push back. I learned long ago, that just because there is an expectation or certain odds, when it comes to hockey(and most sports), you can’t always go by the odds. Sometimes the odds go to the wayside and that team that everyone wrote off, just happens to surprise you. The lights went down, the arena began to fill and the magic was just about upon us. Anthems were song and the puck dropped and the cheers began. Amidst our cheering, we talked about the team, the game progressing pretty well on both sides and taking in the sheer magic that is 18.000+ fans all taking in the moment together. There’s the pure joy of opening the scoring early in the game. There’s the annoyance in unison at the refs/linesmen in the game. There’s the intensity of the game back and forth as the Canucks tried to seal it and the Bruins relentlessly not giving up. There was the unexpected fight from Bo Horvat that only had fans convinced even more so that he’s potential captain material. There was the moment Boston’s relentlessness paid off as they tied to game. There was the moment late in the final frame that Markstrom made a glove save out of the air to keep the game tied, and made for an exhilarating frenzied finish to regulation. As overtime was about to begin, all I could think about was how much I really didn’t want to witness a shootout not because I thought either team was more favoured in that contest but because if passed regulation, I’d rather watch continuous overtime over a shootout any day. There’s a certain intensity that comes with 3-on-3 OT and overtime in general that just cannot be matched in a shootout. And just as I was having those ‘please no shootout’ thoughts without taking my eyes off of the ice, it happened almost in slow motion and then all at once. Brock Boeser stole the puck, had a give and go with Bo Horvat ending with a perfectly placed Horvat shot for the game winning goal. The crowd went wild and we left the arena with an everlasting family hockey memory. Sometimes hockey is about more than just the game itself, it’s about the people. It’s making memories of a lifetime that will long live on. And just in case there’s any doubt, Grandpa has officially dubbed himself a Vancouver Canucks fan. Hockey is for everyone, or IS IT? Here we go again. It’s 2017 and yet here I am re-living a nightmare from last season and no I don’t mean the Vancouver Canucks. No, I mean being a hockey fan who happens to be a girl. This whole being a hockey fan that also happens to be a girl is not always a fun journey. Let’s be honest, there’s often a whole different set of rules and beliefs when it comes to girls who love hockey. If you are a guy and say you love hockey, you are in the club. If you are a girl, you have to constantly prove your fandom and knowledge of the game. If we know the game, then we must have heard it somewhere else, we couldn’t possibly have learned it on our own. If we don’t know something it’s because it’s yet another reason of why girls can’t know this game properly or love it. Or there’s the notion that we merely watch the game to check out the players or love the jersey colours/designs. OR there’s reality that is often overlooked in which we women can actually LOVE the game itself just as much as any man. It’s no secret that I love the game and everything about it from the good to the bad and everything in between. Heck, I write a blog about hockey. I don’t claim to be an expert on all facets of the game and I love learning NEW things about this crazy game all the time. This season, my sister and I were ecstatic to be able to up our support from quarter season members to half-season members for this season. Twice as many times to support our team? To say we were excited is an understatement. We also moved from the lower bowl to the upper bowl which up until our most recent game had been an impeccable experience. I love the experience of being in the arena from the quiet preparation before the chaos, to the warmups, to the anthems, to puck drop and the end to end plays on the ice to the final buzzer. Yes, we are girls, and yes we love hockey but that does NOT mean that we deserve to be treated as though we can’t possibly understand the game or be talked down to or attacked for our jersey of choice to support our team. And many thanks for the ever subtle reminders that we were at a hockey game but I think our jerseys & being decked out from head to toe in our team’s colours made it abundantly clear we were in the right place. And yet while in that right place, my most favourite place, there was pit in my stomach acknowledging that we were not welcome on this night. At final buzzer, my disappointment was not from the scoreboard but from the sheer shock of how some fans turned a place that is a safe place into one that was unwelcoming. And once again, that was beyond unsettling. We were made to feel as though we could not cheer for our team and also were judged for every ounce of support that we did show or vocalize. I’m all for opposition fans supporting their own team BUT I draw the line at attacking the integrity of franchise players, and then turning those insults towards fans of the home team. I can fully accept that we may root for different teams and I respect that. I may not agree with their view all the time, but I respect it and would never spend the duration of the game berating the fans of another team. For the most part, I love talking about the game with Canucks fans and fans of any team, man or woman, any time. What I do not enjoy, is being talked down to and belittled. And yes, it is unfortunately still true that sometimes when I admit how much I love this game that I get given looks of derision that I cannot possibly comprehend what it is I am talking about. When it is confirmed that I do know the sport, these individuals then treat me as though they still don’t trust me even if what I am saying is true and attack my loyalty to my team or why I love this game. Truthfully these experiences leave me feeling as though perhaps I do not deserve to enjoy this incredible sport and then I remember that these individuals who make female fans feel this unwelcome DO NOT represent the entirety of the hockey community. So, while you belittled us and attacked our love of the game, you did not destroy it. You tried and while yes it took me aback, nothing that was said to us or directed to us will take away my love for this team or this game. We should all be allowed to enjoy the game we love without having to feel as though we are being judged or to feel bad when we do. Hockey is more than just a game, it is a community that most of the time is very welcoming and hopefully one day, no one will be made to feel like an outsider. I’ve said a lot in the last year but, it’s 2017 and I sincerely wish that the sentiment that “hockey is for everyone” was actually true. One day, maybe. I know the odds of you reading this blog among all the media available to you is slim to none but I felt it important to get these words out and that maybe you get a chance to see them. You may not know this yet as the media is constantly stating all of the negatives and questioning whether or not the fans still support you, but yes it is true that you do in fact still have fan support. Win or lose, some fans will even stand by you all season long, no what matter the outcome. This season, the majority of headlines that I have seen from local media have been of the negative variety and been attempting to tell me that there is nothing to be excited about as a fan of this team. Maybe to them it is not exciting to get glimpses of the future as prospects get the opportunity to shine or seeing veteran players reach franchise and individual milestones.To this fan, those moments along the journey of a season are almost more magical than the wins or losses. Are there questions that need to be addressed? Yes, but that can be said about every single team in the league. Will there be critics of every trade, signing, draft pick and decision made? Probably. Will any of those questions, decisions or critics influence or when I will support you? No, not even one little bit. Has this season been perfect? No, but truthfully, I never expected it to be. Do I wish that you had more wins overall up to this point of the season? Yes, but even if you had only won a single game on the season, my support would not waver. Every season is made up of different ebbs and flows. Some years will be better than others, but no matter the outcome, playoffs or no playoffs, this fan will stand by you. Do I dream that one day you will win that elusive 16th playoff game? Absolutely more than anything and one day when you DO, I will be able to say I was along for the entire ride, for all the triumphs and struggles that lead to the eventual victory. Yes, I know that day may be in the distant future, but that won’t stop me from enjoying the journey to that eventual win. Perhaps even more meaningful than any on ice statistic is the work that you do as a team within the community and on the behalf of kids across BC. No matter what every season brings on the ice, as a team you always give your all off the ice to the kids and this province. It is an incredible privilege to see the difference that you have made over the years in the lives of so many, and often you may not even know it. Some might think it odd that through it Maybe you will see this post, and maybe you won’t but I hope that you know that despite what a lot of the media will tell, you DO have fans that support you 24/7/365. All the best the rest of the way, this season! Recently when I was attending a Vancouver Canucks game I had an experience that both frustrated and slightly rattled me as a hockey fan that happens to be a female. Apparently I needed to be informed that I was at a hockey game and be told when and how to cheer for MY team by an opposing team’s fan. Yep, because apparently being at the game with my sister geared out in our Canucks gear meant we had no clue where we were or how to cheer for OUR team. Apparently being a female fan to this particular individual meant that we had no idea about the ins and outs of the game. The presumption being that we were only there to look at the players on the ice. Instead of being allowed to enjoy the game, it felt like I was being judged the entire time for everything I said or did for the duration of the game. Yes it is true that I am a woman and I was at a hockey game. Yes, it is true that I am a woman and enjoy sports, especially hockey. Yes, it is true that I actually do know a little about the game and do not need the game explained to me. And while I do love learning new things about the game that does not mean I need a person to “dumb it down” or talk to me in condescending tones about the game. The truth is I have been a fan of this game since I was 17 and have spent a long time learning as much about it as possible about not just my team but the other 29 teams in the NHL, and minor leagues too. Truthfully, I love talking about the game at every level with other fans, truly I do. What I do not enjoy is being talked down to and belittled. And yes, it is true that sometimes when I admit how much I love this game that I get given looks of derision that I cannot possibly comprehend what it is I am talking about. When it is confirmed that I do know the sport, these individuals then treat me as though they still don’t trust me even if what I am saying is true and attack my loyalty to my team or why I love this game. Truthfully these experiences leave me feeling as though perhaps I do not deserve to enjoy this incredible sport and then I remember that these individuals who make female fans feel this unwelcome DO NOT represent the entirety of the hockey community. And to those of you who have had similar experiences, I want you to know that you are not alone. Perhaps it has also happened more then once to you but let’s not allow these moments to take away the game we love from us. We should all be allowed to enjoy the game we love without having to feel as though we are being judged or to feel bad when we do. Hockey is more than just a game, it is a community that most of the time is very welcoming and hopefully one day some will no longer judge others. According to who? The experts and media have all recently come out with their NHL predictions for the 2016-17 regular season. Nearly all of them have the Vancouver Canucks projected to be at or very near the bottom of the rankings. Is that a surprise? No, not in the least but what does surprise me is the so-called experts telling me that as a Canucks fan, I have nothing to be excited about aside from “at this point with no games played, they are undefeated”. Really? That’s the ONLY thing for me to be excited about for the 2016-17 NHL season? Yes they might be right that the Vancouver Canucks might miss the playoffs, they might even end up being at the bottom of the standings. Perhaps a lot of their success this season will indeed hinge on many things going exactly right and for injuries not the stockpile. They may just get all of their predictions correct or maybe the team will surprise the league in a few categories or maybe they will be just above par. Time and how the team plays will tell just which outcome will be true at season’s end. There is one thing for certain that the media is very wrong about: that fans have nothing to be excited about. The 82-game journey might be messy, it might be disaster, it might have incredible triumphs or heartbreak, it might be be extended into the post-season or it might be cut short for a myriad of reasons, but no matter where or how the season ends, I will enjoy every single step of the journey. The season may be messy and imperfect but there will also be moments of pure magic along the way. I love everything about this game and I plan on supporting my team every single step of the way regardless of whether this season ends abruptly or they make the post-season. And most certainly no matter the outcome, I am Vancouver Canucks fan today, will be one tomorrow, will be one at the season’s end and for all the season’s still to come. 24/7/365 and there is no changing my Canuck heart.